I could live without many foods but not without bread. I could even skip the butter but not the bread. Real bread that is: baked from scratch and not par-baked and frozen. Maybe it is because I spent most of my life in Germany, which boasts endless varieties of wholesome bread, that good bread is so essential for me. For a short time I ordered bread by mail but that was decidedly too costly, and the loaves did not become fresher from traveling cross country for several days. Then I started baking our own. Baking bread is a bit like gardening. The outcome is unpredictable. Working the soil and working the dough both feel great. Watching the dough rise is like watching plants grow. And, finally, pulling a loaf of bread out of the oven is as utterly satisfying as pulling a bunch of radishes out of the ground. I have a few basic rules for bread baking. If I am not in the mood, I will not do it. I never start the process when I am rushed and have to be out the door within the next few hours. Working from an office in the house certainly helps a lot, as I can run upstairs to the kitchen to punch down the dough etc. as needed. While I think quality ingredients are important, I am not religious about it – not everything has to be organic. 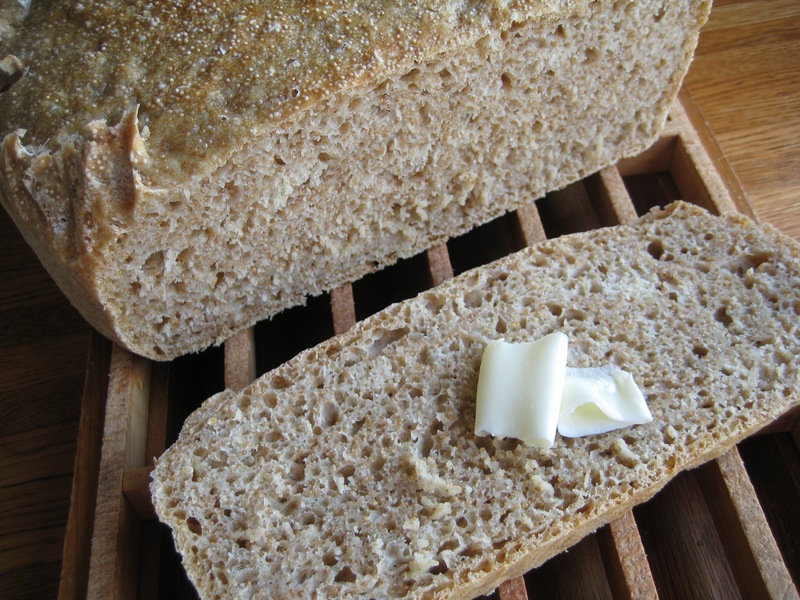 Home-baked bread must be stored in the fridge or frozen because it does not contain any preservatives and molds much quicker than store-bought bread. Not every loaf is great but the bread is always edible. As good as it gets for an amateur, I am telling myself and try not to fret about air holes and other imperfections. The problem that occurs the most is that the final product is a bit dry. That’s why this chewy no-knead bread baked in a cast-iron Dutch oven is one of my favorite bread recipes: the dough can be really sticky because it is not shaped into a loaf. I often experiment with different combinations of flours and grains. Here is my first attempt with amaranth. This makes a large loaf in a 5.5-quart cast-iron Dutch oven. For a small loaf I use a 3.5-quart oval Dutch oven. 1. Toast the amaranth in a large ungreased skillet over medium to high heat until it starts to pop, stirring and shaking the skillet often. Make sure not to burn it. Set aside to cool. 2. Mix the yeast with ½ cup of the water in a small bowl. Stir well and set aside for 10 minutes until it foams. If it doesn’t, the yeast is not active any more, then you need to discard and try with a new batch. 3. Mix the cooled amaranth and flours with the salt in the container. Add the remaining 2½ cups water and the foamed yeast mix. Mix well with a wooden spoon until the dough is evenly moistened and no flour pockets remain. Tightly place the lid on the container but leave one corner of the lid unattached (if you close the whole container tightly, the lid will pop off). Let rise at room temperature for 2 hours. 4. Line a tall bowl or a container that is the same size as the Dutch oven, or slightly smaller, with a large piece of parchment paper. 5. Knead the dough briefly in the container and dump it into the the parchment-lined bowl. The dough is rather tacky and moist. Do not add any more flour, otherwise the bread will be too dry. Transfer the dough to the bowl and cover loosely with a kitchen towel. It should not touch the dough even after the rise, so I place some taller objects, such as a pot or a cookbook holder, on both sides of the bowl and place the towel on top like a tent. Let rise for 1.5 hours. 6. About 1 hour into the rise, preheat the oven to 450 degrees F. Adjust the oven rack to the middle of the oven. 7. Once the oven has reached its target temperature, put the empty Dutch oven covered with the lid in the oven and leave it in there for 20 minutes. If it sits in there longer, no problem, the crucial thing is to have it hot when you put the bread in it. 8. Remove the Dutch oven from the oven and place it on a heatproof surface or trivet. Take off the lid and place it out of reach so you don’t risk touching it. 9. Carefully lift the dough with the parchment paper out of the bowl. This is best done by grabbing onto the four corners of the parchment paper. Hold onto as much of the paper edge as you can. Plop it into the Dutch oven. Carefully cut off with scissors any parchment above the rim. Spray the surface of the dough with a bit of cold water. Cover with the lid and place it in the oven. 10. Bake covered for 30 minutes, then remove the lid and back for an additional 10 minutes. Remove from the oven and lift the bread out of the Dutch oven right away. Peel of the parchment and cool completely on a cake rack.